This post is very different from anything I’ve posted on this blog. I’m horrified by what I am seeing in the news today and felt I had to say something. Today America was alerted to another awful mass shooting. This time it was in Roseburg, Oregon at Umpqua Community College. Yet again, many people died (10 as of this writing) and many (7) were injured. Yet again, the shooter is dead. Yet again, the President has had to make a sad statement to the press. News of domestic mass shootings has become so common it’s not surprising. As President Obama pointed out, everything in these situations has become routine. The news channels will show the President’s speech, they’ll show that day’s live footage of the crime scene, they’ll interview some family members of past and current victims, and they’ll try to understand what mental illness causes a person to commit such atrocious acts. There will be candlelight vigils and lots of comments of sending prayers and good wishes. There will be some arguments. And in the end, inevitably it seems, no real change will be made. In a few weeks or months, we’ll roll through this news cycle again. The President is understandably frustrated. I can’t understand the people who get news like this and still manage to stand up and argue against strict gun regulations. I can’t understand the people who are unable to recognize the heartache in the faces of the families and friends of victims on their screens. I can’t understand why, if you are seeing news like this, you would think it makes sense to make it easier for people to get guns. Because that’s the real issue. Yes, mental health is an issue that needs to be more deeply understood and more carefully addressed. But that doesn’t mean that it’s the only factor in this equation. A person with a mental illness can’t shoot up a building if they have no gun. This isn’t a question of having the right to a gun for self-protection. The shooter in Oregon today had 3 pistols and a rifle. No ordinary citizen needs access to that kind of hardware for self-defense. I’m so angry when I hear arguments based on the Constitution. The first words of the US Constitution seek “domestic tranquility” and provision of a “common defense”. Why are we willing to put those profound ideals aside in favor of an arbitrary individual right?Regardless, even if the only words in the Constitution were “Every citizen shall own a gun”, does that mean we should stick to it? At every step in its history, America has updated its laws as times have changed. Vehicle laws, property laws, voting laws – they have all been updated to reflect the times we live in. Why can’t gun laws be updated too? I sincerely ask the people who support less regulation – aren’t you willing to give up this right (or at least let it be more regulated) if it means saving lives? Aren’t you willing to at least try on the off-chance that it could save the life of at least one child? In this day and age you can’t even say that you don’t know the effects of the lack of policy. You see the victims on your screens all the time. People aren’t necessarily looking for a ban on gun ownership – just some basic regulations. Don’t you want someone who owns a gun to have passed a background check? Don’t you want them to have a license? If you want to own a gun, what’s the harm in going through this besides it being a slight nuisance? If someone can’t pass a background check, why are we listening to their opinions on gun laws? It’s just the start of election season. As it goes on, I urge everyone to think about gun regulation policy as they do the economy and foreign policy and social freedoms and health care – it’s a very real issue, with very, very real consequences. Thank you for taking the time to read this. I welcome a positive discussion in the comments below. And seeing Secretary Clinton was amazing – in that it was very cool to see a woman whom I’ve admired and supported for so long in the flesh. It was awe-inspiring to be in the presence of someone who has traveled so much and represented the U.S. on such a massive scale, who has weathered a world of scandal thanks to her husband and come out on top, and who, somehow, still managed to seem like someone’s wonderful grandma. But in terms of an event, or a chance to get to know your candidate, it was disappointing. The event was three hours long but Hillary was on stage fore barely half an hour of it. Most of the time it felt like we were at a strange concert where DJ Cassidy was playing great music but most people felt too awkward to really dance. 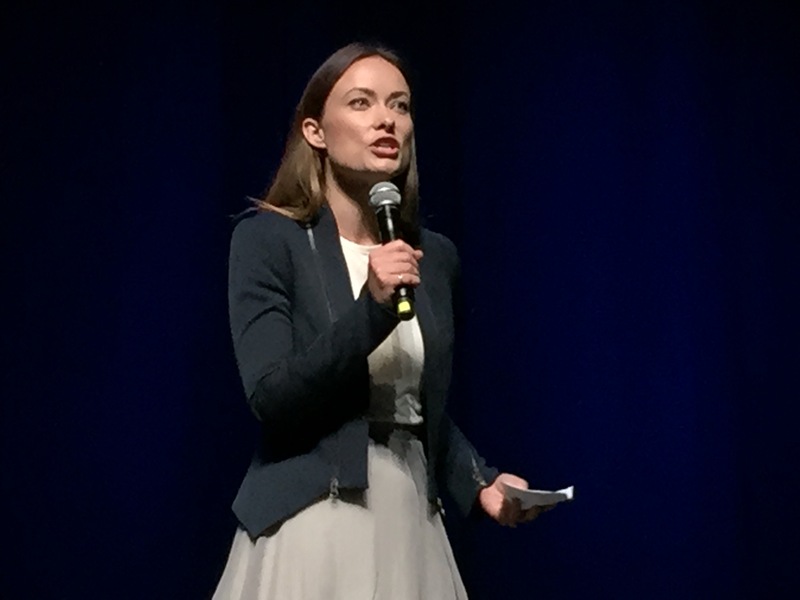 Olivia Wilde came out to introduce Hillary, which was awesome in theory (House, M.D. is my all-time favorite show), but again felt stunted and “campaign-y” – she could have been acting out a role. When Hillary finally came out, I did love everything she had to say. She talked about issues that are very much in the national spotlight, but also highlighted issues that aren’t talked about enough. That’s what I liked about her in the last run for presidency too – she doesn’t only speak about the “hot-ticket” items. She talked about having universal pre-kindergarten, which would make a such a long-term difference in the development of this country and its people. She spoke about how excited she was to meet her granddaughter, Charlotte, but she felt that, “you should not have to be the granddaughter of a former president or a former secretary to have opportunities.” She talked about the need for mental health issues to fall into the realm of open dialogue – for the crazy healthcare system surrounding it to be cleaned up and simplified, and for the stigma to be wiped away. She spoke about how people often feel embarrassed asking for help so she said, “So during this campaign I’m going to talk about substance abuse. I’m going to talk about mental health.” She spoke about how this country is built upon basic bargains – like if you work hard you’ll have opportunities. The themes of the Clinton Global Initiative (making long-term commitments) and her own book/phrase (“It Takes a Village“) rang through her message without her overtly mentioning them. “At the end of the day, what really matters is how we treat each other. I’m going to try to remember that, I want you to remember that.” That was my favorite thing she said, because it’s such a simple a true message, and not the kind of thing you’d necessarily expect to be the message of a campaign speech today. So if Hillary was so great, why was I disappointed? It’s because as much as I wanted to hear and did agree with Hillary’s campaign platforms, I didn’t want to just see “campaign Hillary”. 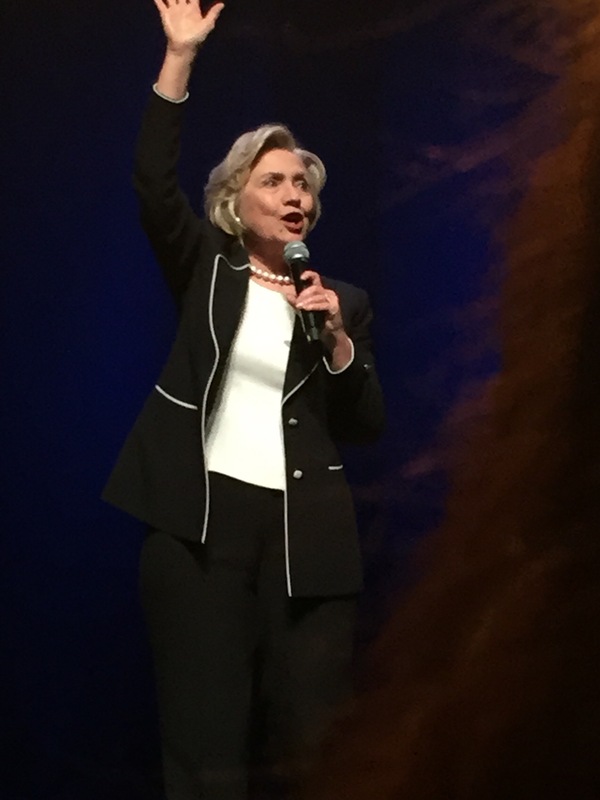 Attending the event felt like I went to a sad concert and then watched Hillary Clinton give a speech on TV. I had thought that for $100, on the night of the first fiscal deadline, I would get at least a longer speech from her, or at least more speeches from her supporters. Everyone who spoke kept mentioning that Zach Braff and Uzo Aduba were in the audience – why didn’t they speak themselves? Why didn’t we hear more from the volunteers who work in her campaign headquarters, especially given that it’s based in New York? I understand that in today’s world, political advisors (and politicians themselves, in turn) are extremely wary of doing anything where they can’t control the outcome. Any situation can be spun. But what I feel like they (and a lot of people trying to use today’s instant, Internet-driven culture to their advantage) fail to understand is that its authenticity and honesty that works. An example from the fashion/beauty world – sure those air-brushed models get a lot of admirers, but look at how the untouched, un-photoshopped pictures that occasionally come out are celebrated! Give the people a chance to actually talk to their candidates. Let them interact. Let them ask questions. The beauty of today’s world is that the lay person has the ability to talk to anybody in the world, regardless of whether they are famous or powerful. People love that. Take advantage of that. I realize it’s scary – what if someone asks a question you don’t have a perfectly scripted answer for? What if someone says something awkward or embarrassing? It’s the world of the internet – every video clip lasts forever! But you’re running to be the leader of a great nation. You’re running to represent this country on a global scale and you will (and have) faced unexpected questions from world leaders and swarthy media-people – much more intimidating, I would think, than your average constituent. I’m sure any question I could ask you would be easier than what Brianna Keilar will present you with tomorrow. Don’t just talk to the people, speak with them. Have real conversations, in person. Don’t try to play the internet game – just be real and the internet will automatically love you for it. Readers, please let me know what you think in the comments below. If you agree and would like this election to be about real dialogue and not just constructed sound-bites, please share this post on your own social media and with the candidates you want to have dialogue with. I think it applies no matter what your political leaning. Thanks!